I had a conversation with a student in Cork at the weekend. He is a fighter, in particular MMA and BJJ. I am not a fighter but i love to explore the needs of all sports from a strength and conditioning viewpoint. He was telling me how easy it was to get some of the bigger type fighters to submit. These are the type that are muscle bound and inflexible, particularly around the shoulder and scapular region. He can get them into a particular position or lock where they are sure to submit. What these type of fighters are lacking is strength and mobility around the shoulder complex. The Kettlebell Arm Bar would be an ideal movement for them to help improve strength, mobility and overall shoulder resilience. The Kettlebell Arm Bar will also help throwers (Water polo players), Pitchers, and racket sports athletes improve their R.O.M. with an improvement in strength and power and a reduction in shoulder injuries. 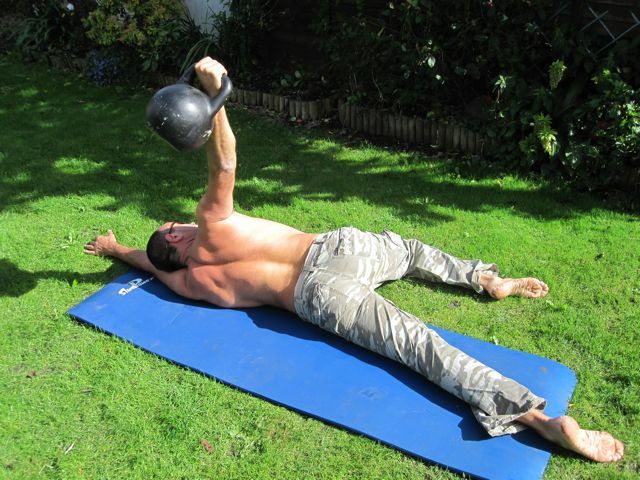 The Kettlebell Arm Bar is a good postural correctional movement for the rounded shouldered kyphotic person. It will open up the pectoral area, whilst strengthening the surrounding tissues. 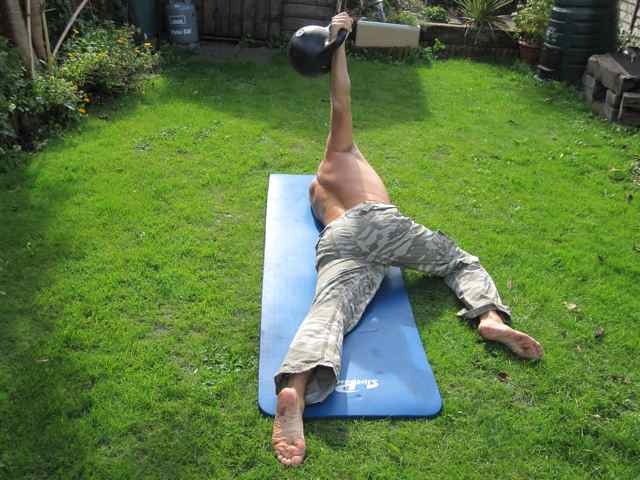 Ensure you seek instruction from a qualified hardstyle kettlebell instructor before attempting this movement. To perform this on the right side, get down on the ground and press a light kettlebell up to arms length as you would in the Turkish Get Up. Cross your right leg over your left and slide the right knee up towards to abdominal region. Your left arm will go overhead along the ground where your head can rest on it. Keeping the right arm vertical and straight try to roll into a prone (face down) position, ensuring the right side lat is tight. Only roll as far as your mobility permits and hold this position for breath cycles. Repeat on the opposite side. Do this movement regularly for improvements in shoulder strength, mobility and overall healthy powerful shoulders.